Whoever created this art technique must have been drinking a lot of coffee when he or she saw a pattern in cups sitting on the table. Flew into Paris yesterday. Today and tomorrow we’ll work on getting over jet lag as we take a hop-on-hop-off bus around the city. Looking forward to sitting outdoors at those quintessential little outdoor tables. On Friday we’ll start an eight-day river cruise on the Seine. An easy way to create posts while I’m gone is to use videos and photos I have found pleasing, inspiring or funny. Let’s call them “Video and Photo Take-a-Breaks.” Enjoy them while I am enjoying my vacation. 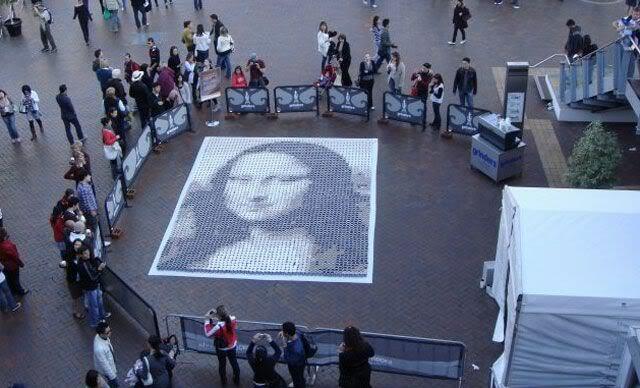 I would never have thought to create this Mona Lisa on a sidewalk in Sydney — or figured out how to do it. 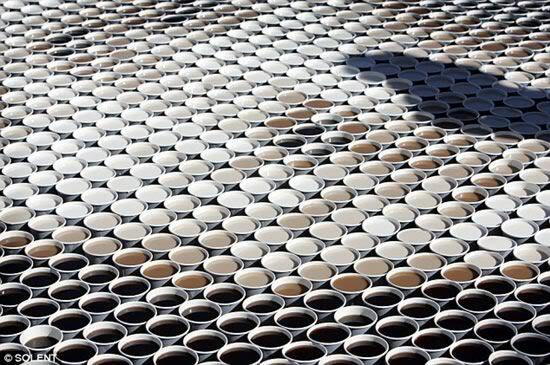 3,604 cups of coffee were each filled with different amounts of milk to create the different tones and shades!